Construction has started on the world’s first super telescope, which will bring us a step closer to understanding the inner-workings of our Universe. The first stone was laid last week in a ceremony in Northern Chile, in the Atacama Desert, the world’s driest desert. When completed, the super telescope – called the Extremely Large Telescope (ELT) – will be the world’s largest optical and infrared telescope. It will have a main mirror 39-metres wide, which as its name suggests will be massive. In this article, the terms Extremely Large Telescope, ELT, and super telescope have the same meaning. Unlike any telescope before it, ELT will also be an adaptive telescope – it will have the ability to correct turbulence in the atmosphere, thus taking telescope engineering to a completely new level. To mark the beginning of the construction project, a ceremony was held at the European Southern Observatory’s (ESO’s) Paranal residencia in northern Chile, very near to where the ELT will be built – on top of the Cerro Armazones, a mountain peak 3,046 metres high. The mountain top is a privileged zone for optical astronomy, because it has on average 89% cloudless nights a year. The ceremony was attended by the President of the Republic of Chile, Michelle Bachelet Jeria, Tim de Zeeuw, Director General of the ESO, and other lawmakers, scientists, and ESO personnel. 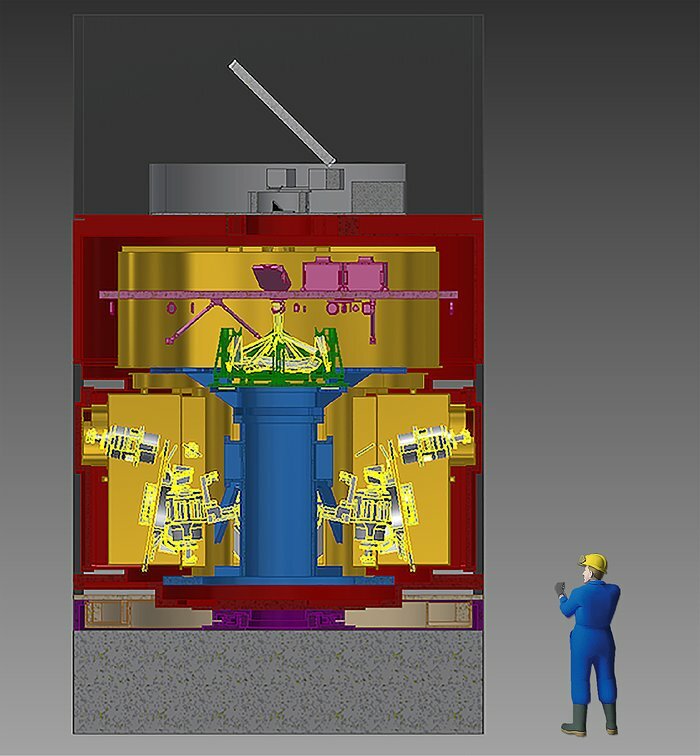 The super telescope is being built by the European Southern Observatory, an international collaboration supported by the United Kingdom’s Science and Technology Facilities Council (STFC). Scientists from Oxford University are responsible for the design and construction of the super telescope’s spectrograph, called HARMONI. HARMONI stands for High Angular Resolution Monolithic Optical and Near-infrared Integral field. HARMONI is designed to take 4,000 images simultaneously. Each image has a slightly different colour. The near-infrared and visible instrument will harness the ELT’s adaptive optics to provide amazingly-sharp images. During the ceremony, a time capsule created by ESO personnel was sealed. It contains a copy of a book describing the super telescope and its goals, images of ESO staff involved in its construction, and a poster of an ELT visualisation. The capsule’s cover is engraved in a hexagon made of Zerodur©, a one-fifth scale model of the primary mirror segments of the super telescope. If all goes according to plan, the super telescope will be operational in 2024.